When a piece of fabric or an apparel product is washed, its size (dimension) get shortened from its original size after the wash (laundry process). 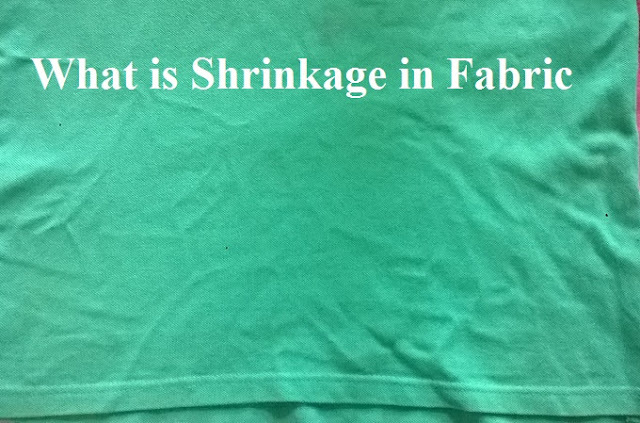 The process of shrinking the fabric's original size is called shrinkage. In the subsequent washing, the clothes shrink more. Shrinkage may happen in any kind of wet processing or heat processing. The shrinkage may happen in lengthwise, or in widthwise, or in both ways. Shrinkage is a negative effect in the garments if the garment shrinks more than a certain percentage (normally 2-3%). In case the fabric is not pre-shrunk whether it's a knitted or a woven fabric, garment made from that fabric will shrink to some extent. In the fabric production processes (dyeing, printing and finishing process), the fabric is inevitably stretched by machine and tension exists in the fabric. The fabric relieves its tension when it is get washed and tumble dried, which results in shrinkage in the fabric. Even if the fabric specimen dipped into water over a night fabric shrinks. Shrinkage in garments and fabrics. Definition of shrinkage.